?Tapis? Piaget, No 6793566, case No. 172990. Made circa 1970, retailed by Van Cleef and Arpels. 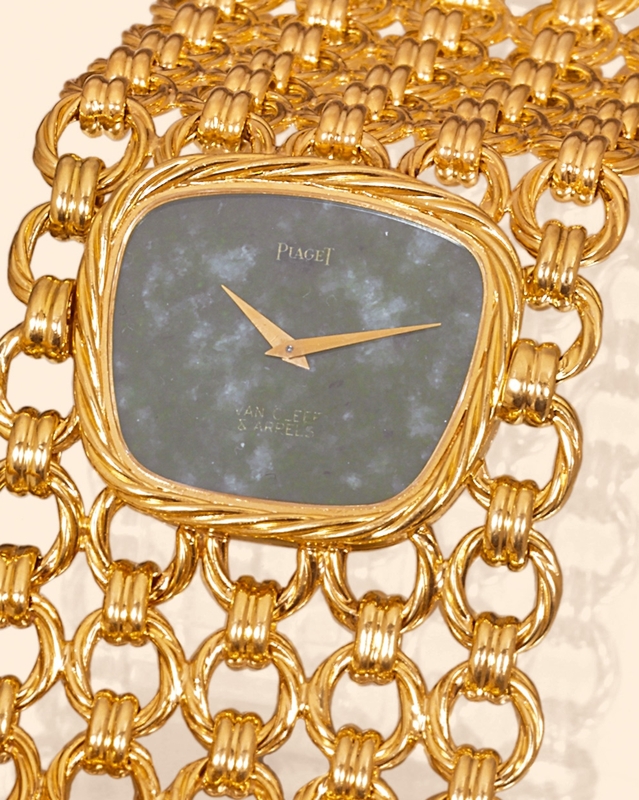 Very fine and unusual, large, 18K yellow gold lady 's wristwatch with an integral chain link gold bracelet bearing a rectangular aperture in the middle showing the Malachite dial. C. Two-body, massive, polished, back secured by four screws. D. Malachite with signature. Yellow gold "Dauphine" hands. M. Cal 9P, flat, rhodium plated, 18 jewels, straight line lever escapement, monometallic balance adjusted to temperatures and 5 positions, shock-absorber, self-compensating flat balancespring. Dial, case and movement signed. Width of the bracelet: 43 mm. Bracelet measuring approx. 190 mm. C. Two-body, massive, polished, back secured by four screws. D. Malachite with signature. Yellow gold "Dauphine" hands. M. Cal 9P, flat, rhodium plated, 18 jewels, straight line lever escapement, monometallic balance adjusted to temperatures and 5 positions, shock-absorber, self-compensating flat balancespring. Dial, case and movement signed. Width of the bracelet: 43 mm. Bracelet measuring approx. 190 mm.